EAT MORE WHOLE GRAINS cookbook includes over 200 recipes plus many hints and ideas on perfect yeast baking so you can turn out delicious baking for you and your family. Includes instructions to mix the recipes by hand, and as well to mix by using a dough mixing Bosch or other machine. These machines allow you to bake large batches . . .even for selling! Commercially milled flour has the germ removed; the place where most of the nutrition is found. Having access to whole grain flours or a mill and grains provides us with the many beneficial nutrients found in grains and seeds. Winnie shares how easy it can be to bake delicious whole grain or unbleached flour breads, rolls and sweet breads. Winnie shares how you can easily knead the dough by hand or follow her simple steps using a Bosch or other dough mixing machine and cut your work & baking time in half. Great for busy folk & easy for tired wrists! If you are fortunate enough to have a Bosch or other dough mixing machine, the machine does all the kneading for you & you can turn out 6 loaves of freshly baked bread in just two hours. And for those who prefer to knead & feel the dough, these recipes & the instructions are also for you! Grains, Pulses and other seeds are packed with nutrition. This cookbook includes many recipes that combine grains & pulses to provide more beneficial nutrients & a complete protein. Besides over 200 recipes, Winnie has added extra tips and hints to every page to make baking easy & successful. The recipes are given in detail for any young new bakers as well. AND NOW as of January 23rd 2019! 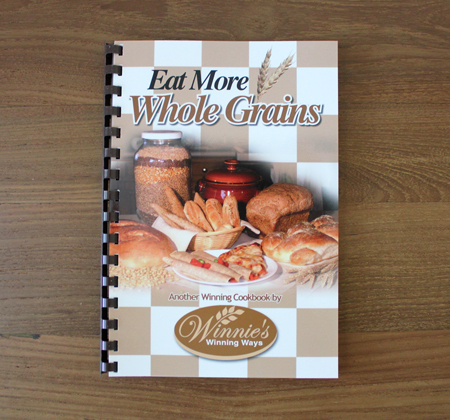 For the many who want or need to serve gluten-free, dairy-free, sugar-free or yeast-free, Winnie has written a supplement of great recipes to add to this cookbook that she will email FREE with each EAT MORE WHOLE GRAINS cookbook purchase. The title of the new guide is . . . EAT WELL . . . . LIVE WELL! Embrace the changes in this new guide and your body will thank you!